Turn away from THE TAP today! Water is where it's at baby! Diss everything except nature's crystal, clear, liquid wonder then walk away from the bloody faucet and start becoming the bottled water connoisieur that you were born to be! 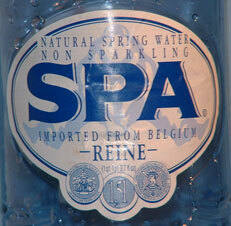 My favorite, after a considerable and lengthy period of taste testing, is SPA. SPA water is the most deliciously smooth provocatively clean sip of a sensation that springs from the face of the earth. AND it doesn't stop there ... SPA water is packaged in the UBER cool blue bottle that is sure to open all doors to the cool crowd. DRINK and be NOW! LEROUX CREEK APRICOT APPLE SAUCE is my sugar-free deity! Packed with the punchy taste combo of apricots and apples this divine cup of heaven is enough to make a bad girl go good. I love it as a perky afternoon snack or as an anytime weapon for battling candy bar demons and the evil pastry spirits. Also available in 10 other action packed flavors including berry apple, cherry apple, mango apple, guava apple, plum cherry apple, berry banana apple, orange apple and cinnamon apple. If you've had a LUNA bar, then you know it inspires cult-like devotion and opens hell-mouth debates regarding which flavor is the personal best. For me, that flavor is CHOCOLATE PECAN PIE. A supreme combination of soy protein, 23 vitamins & minerals, high calcium and folic acid which specifically come together to meet nutritional requirements for WOMEN'S (heh, heh, heh) needs and melt in the mouth like a chocolate dream. I have one for breakfast and glide through the day with energetic, ease. available at wholefoods and in the health food section of most grocery stores.